Fibreglass does not bend. The big problem with many plastic tanks is that they are not strong enough and if the groundwater is higher than the base when they are emptied, they distort and are no longer fit for the purpose. Some distort even when full, as groundwater pressures can be immense. As they bend, always inwards, the volume is drastically reduced, making them too small to work properly. Lids no longer fit. Drain connections snap off, drain spigots bend downwards, ruining the gradient of the drains and causing the system to 'back-up'. Internal baffle walls can become detached, allowing both chambers to flood into each other. The settlement is destroyed and the soakaway is soon ruined. Opposite is a photo of the distortion possible when poor quality plastic systems are installed in wet ground conditions. The septic tanks pictured on the right all had to be removed after installation, as they were not strong enough to withstand the pressures of groundwater. There were 50 scrap septic tanks in this yard. We are now horrified to see MDPE (medium density polyethylene) used for tank construction instead of HDPE (high density polyethylene). MDPE was never intended to be used for underground installations, but they are cheap to buy. "There is hardly anything in the world that some man can't make just a little worse and sell just a little cheaper; and the people who buy on price alone are this man's lawful prey". The construction may look strong, but groundwater pressure is far greater than people can imagine. It is no use trying to test the strength of the septic tank by submerging it in a pool. The water is immediately displaced and rises up the pool walls. Groundwater cannot do that as it is contained by all the weight and density of soil above it, so the pressure increases to an enormous extent. Surrounding the septic tank with concrete does not stop this distortion. Concrete is not waterproof and the groundwater forces its way through the concrete and bends the tank anyway. 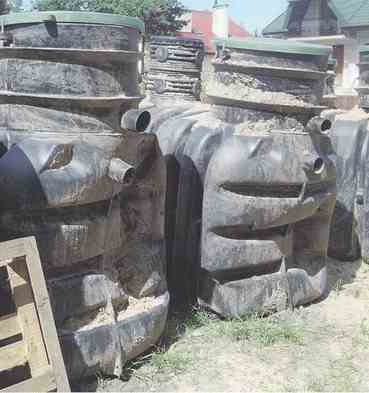 Any septic tank must be very strong to withstand it, but you don't find out if it bends until it has been installed. 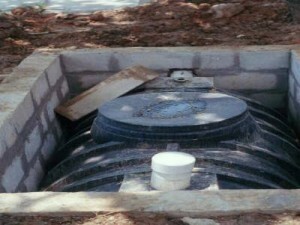 In our experience, the only safe way to install a plastic septic tank is to build a waterproof chamber for it to sit in. See photo on the right, where the chamber has also been waterproofed with a plastic membrane on the outside of the block walls. Any other method of plastic septic tank installation risks distortion, but this procedure is expensive. Always buy the best quality septic tank that you can afford. The Crystal is a high quality, one-piece fibreglass construction with a 25 year warranty. The Class 1 Crystal Septic Tank option can be installed with a gravel backfill, even in high groundwater areas, without risk of distortion or cracking. The EN12566-3 Tank Strength Test is only mandatory for the CRUSH strength. In this test, the tank is weighted on the top with increasing weight until it collapses. This test does NOT mimic the effects of groundwater, as groundwater exerts pressure from all angles, including the base of the tank and the sides. There is an EN12566-3 test for groundwater pressure resistance - the WET PIT TEST - but, stupidly, this test is OPTIONAL and many manufacturers, particularly if they have doubts about their tanks, choose to opt out of this essential test! In the wet pit test, the tank is buried in gravel and water is pumped into the gravel to simulate groundwater pressures. Even then, the manufacturer decides the depth of the water surrounding the tank. Some manufacturers claim that their tank has passed a wet pit test when it has only been partially submerged in water. They can also dictate how long the tank should be tested for. This is not good enough, in our opinion. Has the tank got the EN12566-3 Wet Pit Certificate? How deep was the water surrounding the tank? How long was the tank tested for? If they won't tell you DON'T BUY THEIR SEWAGE TREATMENT PLANT as you have no idea what your groundwater will do to the tank. As a guide, the VORTEX sewage treatment plant has got the Wet Pit Certificate. It was submerged in groundwater to a level above the inlet pipe (the water was only 300mm. below ground level) for 3 weeks.